Type SF flush diaphragm seals unique design allows for easy installation and maintenance. The design permits free movement of the diaphragm with simultaneous response to pressure changes. It also protects the seal element from distortion due to improper handling during maintenance routines. SF Series metal seals are continuous duty elements with an all-welded construction free of gaskets. 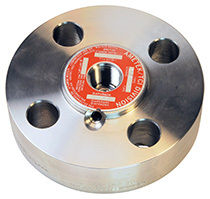 SF Series diaphragm seals can be specified with ¼" or ½" NPT instrument connections and are flange mounted. The SF Series diaphragm seals can be mounted to most transmitters, transducers, pressure switches, pressure gauges, process controllers, or other forms of pressure sensing devices. The SF flush flanged seal element is used for pressure applications only and features a standard raised face type flange. It is supplied for standard ANSI Class ratings of ½"-150# to 3"-2500# and 4"-150# through 300#. Metric sizes are available upon request.